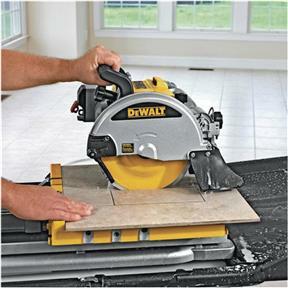 Cutting tiles is tough work, but this 15 amp DEWALT saw is up to the task. 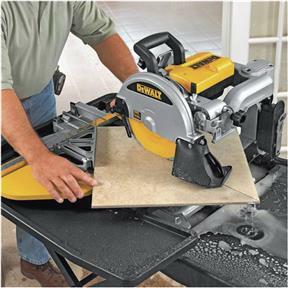 Its powerful 1.5HP motor allows the 10" diamond blade to cut cleanly and accurately through hard materials like porcelain and stone. A generous 3-1/8" cut depth allows you to use this saw when cutting most V-cap tiles and pavers. 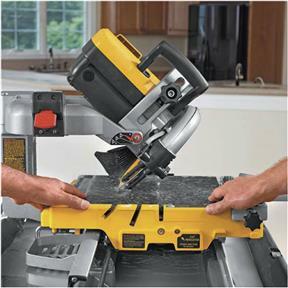 A versatile plunge feature allows you to make quick plunge cuts when shaping pieces to accommodate electrical outlets, A/C registers, and more. This DEWALT saw's sturdy, stainless steel rail system is integrated right into the saw frame, ensuring the accurate cuts you need while also offering excellent durability. The cantilevering design of this saw's rail and cart system allows for 24" ripping capacity and 18" tile diagonal. It also allows for accurate diagonal cuts when working with tiles that measure up to 18 inches making it ideal for small and large tiling projects. A convenient miter feature is also integrated into the saw frame and offers stops at both 45 degrees and 22.5 degrees. Also, the saw's unique edge guide makes it incredibly easy to line up corner cuts. This DEWALT saw's dual water nozzles can be adjusted to deliver optimal water placement on the blade, minimizing messy over-spray and distracting mist. Rear and side water attachments help contain water runoff and blade spray for a cleaner, easier-to-manage work space, while the saw's five-gallon, durable ABS water pan allows for quick setup and takedown. 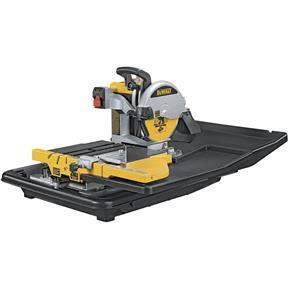 Built to be Compact, Convenient, and Durable Portability is essential for a tile saw, and this DEWALT fits the bill. Weighing 69 pounds with a compact frame measuring 34 by 26 inches, you can easily transport, store, and set up this saw at home or at a jobsite. And when it's time to pack up, the removable cutting cart makes cleaning this tile saw quick and easy.